"If there's an emergency, I guess you're out of luck." When a Cardassian ship is destroyed right next to the docking pylons of Deep Space Nine, Sisko and his crew – and even Quark – are drawn into a web of intrigue and interspecies skulduggery which result in his teaming up with Gul Dukat to find the truth. The larger storyline of this episode describes how our crewpeople are reacting to and working with a politically very tense situation in an interplanetary setting. What balance can our crew find? And yet everything pivots on Deep Space Nine. When a Cardassian ship is destroyed in Bajoran space, they worry of course that Bajorans will be blamed. But the problems for the Federation are far deeper; an old friend of Sisko's, Lieutenant Commander Hudson, appears to complain about the Cardassian treaty. 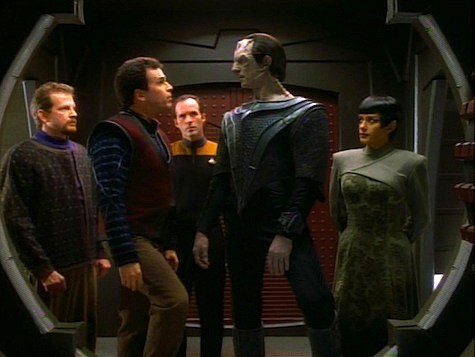 Things come to a head when Gul Dukat appears in Sisko's bedroom claiming that the destruction of the Bok'nor is actually a terrorist act performed by a group called the Maquis – and the terrorists in this case are from Federation colonies, the killers human. And so the threads of the story are set up. It's fascinating to watch their reactions. We haven't seen much of Dax yet, but she tries to play peacemaker. O'Brien thinks not enough is happening to create security on the station. Odo is all for increased security powers. Sisko seems to have a little blind spot about the preferences people might have for peace; Kira is all too aware that, where there's power, there's abuse. The story for this episode is a curious revision of "The Wounded," the Next Generation episode which introduced Cardassia and the Cardassians themselves. In that episode an old C.O. of O'Brien's became convinced of Cardassian terrorism, and thus led the charge to attack Cardassians. In this episode, we see a friend of Sisko's - arguably one of the closest of Sisko's friends we've met yet, outside of Dax, and the Cardassians are also attacked, and it turns out to be one of Sisko's friends leading the charge. 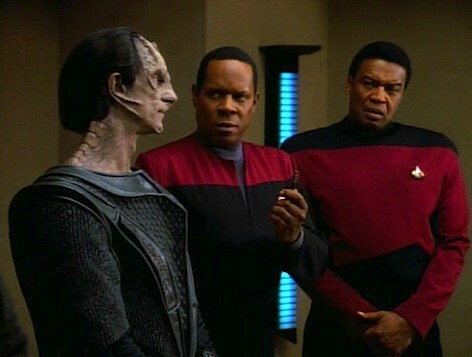 The moment when Hudson came out with the terrorist group, the Maquis, it all made sense, and you could see what a bitter moment it was to Sisko. 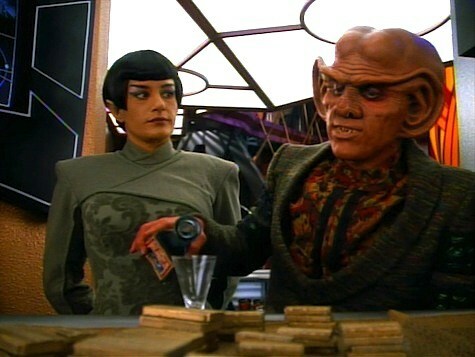 Quark and his affair with the Vulcan dealer Sakonna orchestrating whatever's going on behind the scenes for the Maquis was a little eye-roll worthy, unfortunately. After "Profit and Loss" it was disappointing to see Quark revert to leering Ferengi type; I thought we were looking for more from the character. Sisko and Picard are, to me, the most alike of the Trek Captains/Commanders in terms of being Daniels come to judgment. It remains to be seen exactly how Sisko is going to deal with the capture of Gul Dukat and the betrayal of Hudson – and whether Dukat and Sisko can get out of the traps they've each respectively been caught in. The big problem for Starfleet of course is Hudson; his connections to the Federation and Starfleet make whatever is happening with the Maquis, a Starfleet problem, and opens the door to a wider conflict. Such a match-up seems inevitable, anyway. What's the saying? If you will have war, prepare for war? Dax has no problem going out with species not, apparently, considered compatible by Kira. I'm not yet sure about L.C. Hudson's complaints yet. It seems from what he says that the Cardassians aren't protecting Federation colonies, like those in the Federation would protect Cardassian colonies. Protect against what? The Cardassians themselves, generic space pirates? What terrible attacks are inspiring this rebellion? I figure that there's colonies of Cardassia and colonies of the Federation and that colonies are just slightly politically different than planets, but it could be made clearer. The weird scene in the shuttle where Dukat pretends not to know what the controls are, then knowing the whole time. He plays power games like other people breathe. Anyone ever look at him and think "Petyr Baelish?" Hudson: Then, maybe he did do it, Ben. I don't know. Damn! I've got to go see his wife. I don't know what I'm going to tell her. Makes you pine for the good old dull days in New Berlin, doesn't it? Sausage and beer all around, and everyone's idea of a good time was the Mazurka Festival. Sisko: Gretchen and Jennifer had a ball together there, didn't they? Hudson: I'll never forget the sight of you in those lederhosen. Sisko: I still have the hat. A great first parter – but hoping part two isn't a let down! Four out of five implosion bombs. I'm sure you're happy to get here in your reviews, Joseph. ;-) This really is the episodes where Deep Space Nine takes off, after a slew of meandering and uninspiring fare. That's not to say all was bad, but you really notice a clearer sense of direction and purpose to the storytelling after these episodes, The Wire, The Jem'Hadar and especially the season three Improbably Cause two parter.